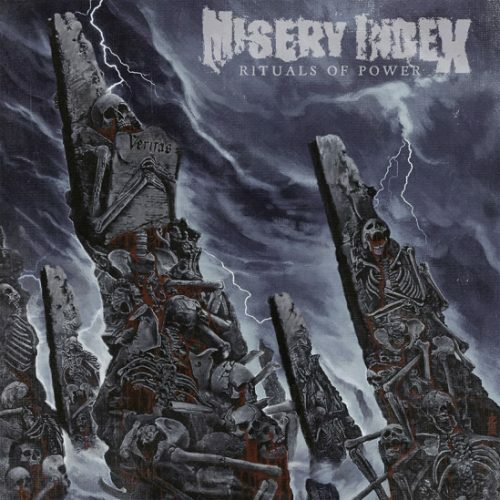 While we’re briefly on the subject of Misery Index lyrics, I’ll put in a plug for Andy Synn‘s most recent Waxing Lyrical column in which the the band’s principal lyricist Jason Netherton discussed his inspirations and methods. Shying away from topics of burning political relevance isn’t one of those methods. Fiery musical intensity is obviously another hallmark of this band, and that comes through in spades here. 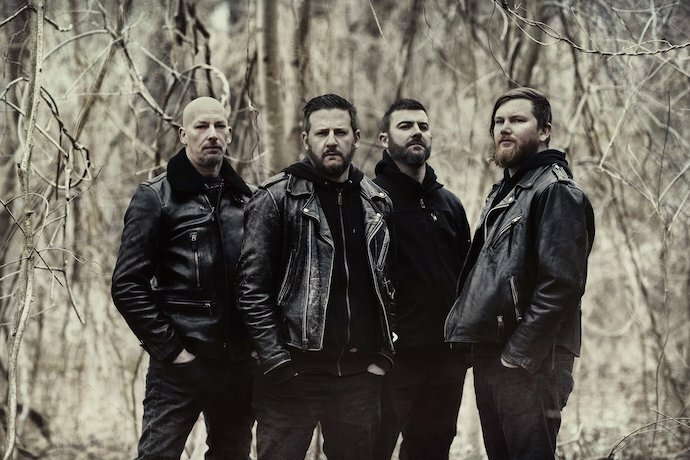 It’s a turbocharged yet tempo-dynamic attack, dark but defiant, and loaded with fast-twitching fretwork, scalding vocals, bleak anthemic chords, a spiraling solo that channels heartbreak, and a punishing percussive drive. 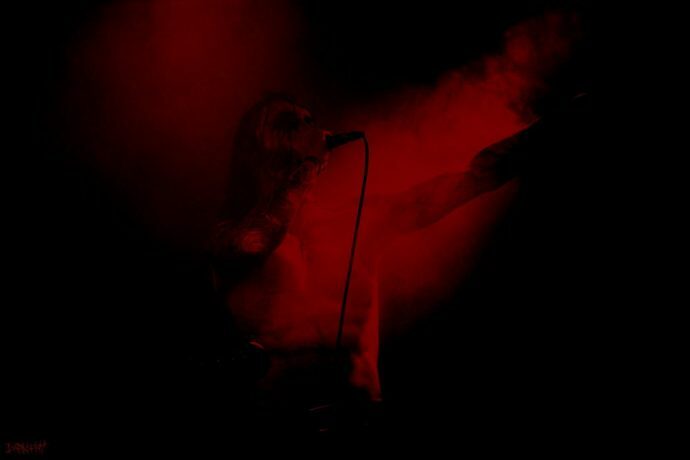 Last year this Australian black metal band, whose previous releases have been enthusiastically praised at our putrid site, disclosed that they were working on a new album, and today they disclosed that its name is Kali Yuga Crown — and they also released a song from the album, “Verminblood“, presented through a lyric video. The introductory passage is dreamlike, wistful, and beautiful… but the strands of melancholy woven into it become much more prominent when the meat of the song arrives, and the mood deepens into anguish — and then becomes a vicious fury. The night-dark melodies become entrancing, but the words of the song’s protagonist revel in death. The new album’s release date hasn’t been identified. Follow Advent Sorrow here to find out when that happens. Jay Gambit, the man behind Crowhurst, has been a prolific creator of music and noise — but good luck trying to predict what his recordings will sound like from one release to the next. It has ranged from noise to drone, sludge to black metal, and beyond. Guessing what Crowhurst’s new album III (recorded by Kurt Ballou) will sound like is now perhaps a bit easier, because of a first single released two days ago — but I wouldn’t put too much weight on it, since the rest of the album could well throw you more than a few curveballs. There are other participants, along with Gambit, on this new album, though I haven’t found a complete listing. Presumably those disclosures will come. The album will be released by Prophecy Productions on April 5th, and that first single is “I Will Carry You To Hell“. As my comrade DGR observed when he discovered it, it does a good job evoking that feeling. Ominous droning tones and ecclesiastical chanting open the track. The voices soar in praise or supplication when the music leaps immediately into a red zone of intensity and caustic snarls enter the frame. 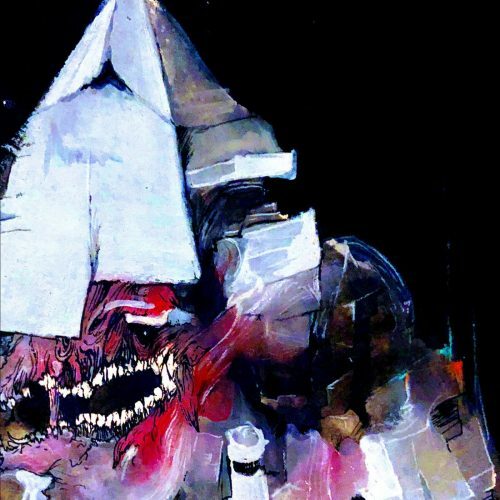 Organ-like keyboards also soar in a manifestation of haunting glorification, contrasting with the frenzy of the drumming and the sheer violence of the voice. You can imagine standing before the vast and ancient gates of Hell as they begin to swing open in terrible welcome. I guess there are still people out there who are unaware that we do make well-earned exceptions to our prohibitory Rule about singing. Not often, mind you, but it does happen, and it’s happening again with the last two songs in Part 1 of this round-up. I should have paid attention long ago to the new album (Vol. 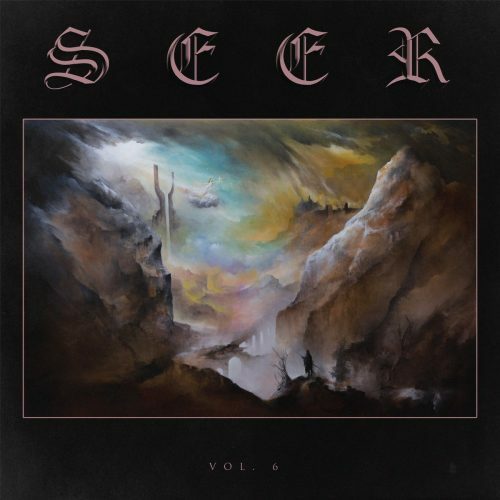 6) by teh genre-bening Seer from Vancouver, B.C., because I’ve been such an ardent fan of their past work (and have hosted premieres for some of it as well). Better late than never, I hope. This new album is due for release on February 8th (tomorrow), and although I don’t have a complete review for you, I do have the two songs now available for streaming on Bandcamp, provided here in the hope that it will induce you to listen to the rest of the record tomorrow. “Iron Worth Striking” channels a chilling atmosphere of grandeur, dread, and doom in powerfully dramatic fashion. It’s a massive, bone-crushing, and powerfully head-moving track, with a multitude of guitar textures and a vocal performance that soars beautifully — and is also absolutely incinerating. “Seven Stars, Seven Stones” is anchored by a huge, mid-paced stomping groove, and over that pounding cadence the band create sweeping music that’s also grand — and very bleak. Fantastic vocals in this one, too, as well as a wailing, anguished guitar lead and a soulful dual-guitar solo that bleeds bereavement. All of that helps stick this track even deeper into the listener’s mind, and like “Iron Worth Striking”, it builds to a fantastic crescendo before the chilling outro. The last song in this collection boiled my blood over a high heat and lit my head up like a Roman candle. I got so damned excited listening to it that I let it rip two more times in quick succession, and I’ve kept a tab to the stream open on my computer so I can get a quick burst of joy again whenever I’m feeling sluggish or morose. 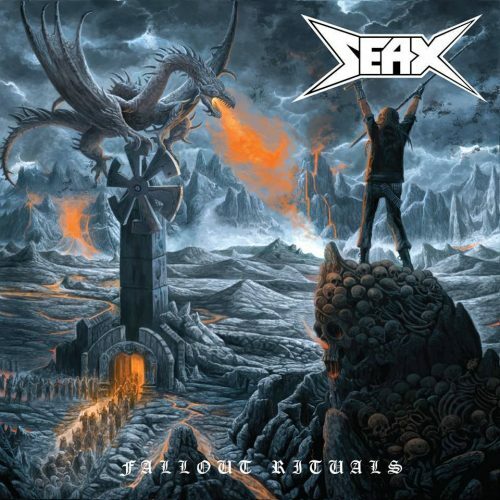 The song is “Killed By Speed” by the Massachusetts band Seax, from their new album Fallout Rituals, which will be released by Shadow Kingdom Records on April 5th (and features cover art by Juanjo Castellano Rosado.). As the title suggests, it’s a classic, high-octane speed metal extravaganza, which pays homage to a lot of classic sounds from the ’80s (including NWOBHM). “Soaring vocals, exploding solos, locomotive drive, clear-yet-cutting production, absolute desire and desperation at every turn” — that’s how Shadow Kingdom describes the music, and it’s dead-on. I discovered the song through its recent appearance on Bandcamp, but it turns out there’s a music video for the track which was released in early December, so I’m including that below as well. Feed on speed below.